Well here I am back at the PC at last. Not that I haven't been at the PC this week - I have been quite a lot, but not blogging! We have much going on in our Civic Society at the moment and as the secretary I have much to do. The rest of my time has been spent gardening and chicken counting/feeding/sorting. This afternoon we are meeting some others on the derelict canal to do a spot of weed/shrub clearing. We are then meeting with the Greenways officer for the district to explain why we don't agree with her proposed route. That will mean more note writing and emailing I suppose. 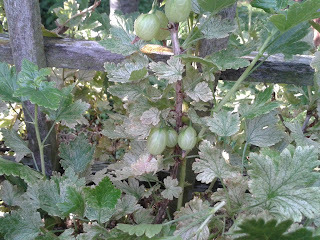 I was glad to see that Frugal in Suffolk is selling her gooseberries and what she is charging. I usually sell my excess, but haven't too much this year (see old blogs!) but I do have SOME. 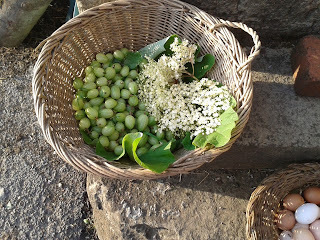 I have googled the price of gooseberries and can't find anywhere selling them to compare with. SO seeing F-in-S's punnets is good enough for me. That's what I will charge! Iv'e already sold all my rhubarb, which I'm pleased about. Off to attack the jungle with the guys now and I shan't be away from my blog so long next time. 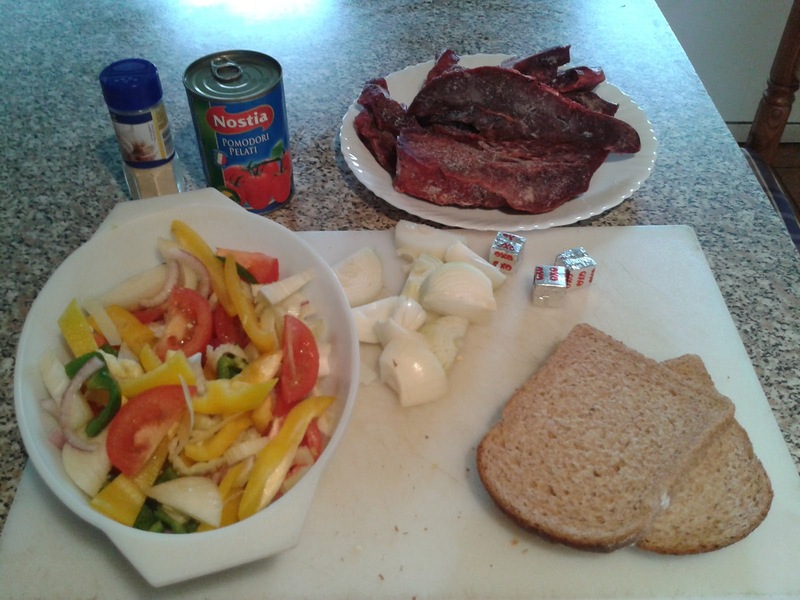 Have you noticed I have a picture at the top of my blog page now? YD helped me to put it up,...truth to tell I did nothing, she did it all. The picture is of YGD doing a jigsaw with the help of our deeply missed bantam Marjorie. This was taken last summer in our fruit garden, where we often eat and play and craft. It is one of my favourite pictures. I hope you like it too. Adam's mum is unwell so he has come to stay for a while. We have sat and worked out what we are going to eat and I have decided that he is naturally frugal ! Last night we had Chicken Pie (his absolute favourite). He has chosen Toad in the hole with mash and cabbage for today (will cook extra for bubble and squeak) and meat balls for tomorrow. He says if he is still here the day after he would like fish! Don't you just love an "easy" guest ? I keep finding eggs all over the place, so I collected a few random ones the other day and put the ones that floated in the incubator. Worth a try !! This afternoon I had a peek and there was a tiny black chick, completely dry and cheeping his heart out. 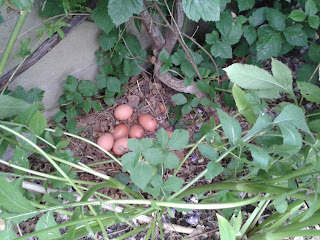 Lifting up the broodies (Oh the indignity!) I have found a newly hatched chick, so have snook the incubator chick in with it, so that hopefully the broody will look after it. Worth a try eh? I took Adam to the hospital today for a scan. He had to go without food or drink ( apart from water) for 6 hours. So as we were shopping I asked him what he would like to eat in the car straight after his scan. He chose sausage roll, so I bought some from Lidl. Blimey, I was not impressed ! I could have made some as cheaply, if not cheaper I reckon. 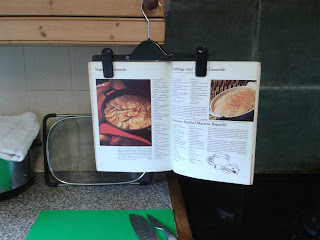 I must make some and cost them out. The elder flowers are just coming out here. Some reckon they are late. 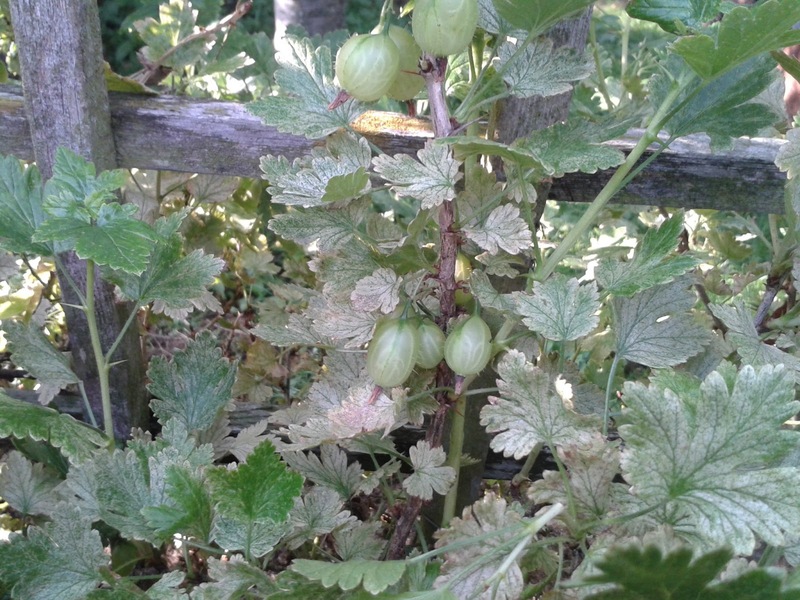 If they are, so are the gooseberries as I usually put some elderflowers in my gooseberry jam and the little green darlings are nowhere near ready yet. YD had an interesting weekend looking after our smallholding. On Saturday she started the day by finding a newly hatched chick cheeping from the very top of the orchard chicken house. It was sitting with a few unhatched eggs making a huge noise. YD phoned me....."any ideas?" "Are the eggs still warm? because if they are, mum is not far away" YD went towards the chick and eggs and a white screaming bird came back to "save" her baby and sort YD out! Once the mother had been identified (no brainer) YD covered the lot with a cloth and removed them to a safe pen in the barn, where they wouldn't be harassed by others, nor would the chicks throw themselves off the high-up box to their possible deaths. After feeding the hens, chicks and rabbits she gave the lambs their bottles before watering the greenhouses and trays of veg plants waiting to be planted. After a spot of shopping for a BBQ she was hosting that night in our fruit garden, she went into the front garden to watch the bees while she had a coffee. She, like us, can watch them for hours they are so interesting. She could hear that they were noisy and realised that our second hive was probably about to swarm! She then watched something I have never seen in 40 years of beekeeping. 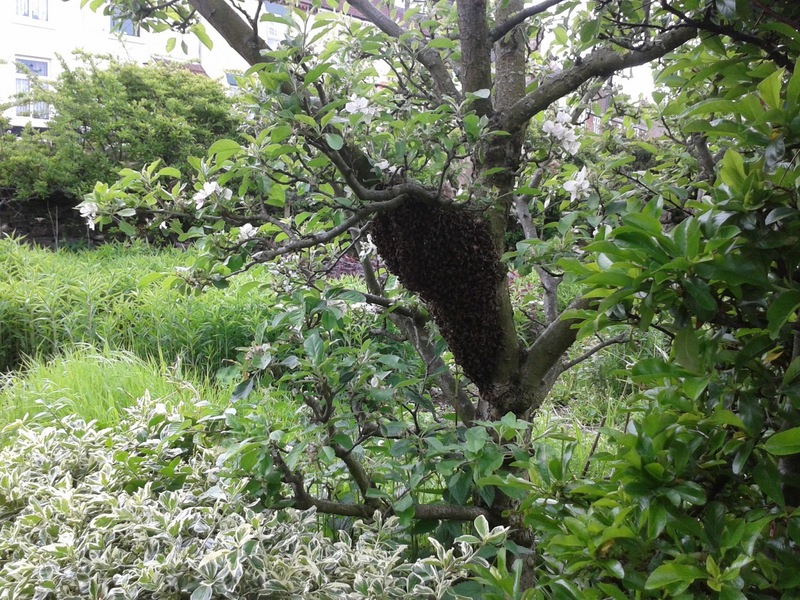 -- A swarm actually leaving the hive - I AM SO ENVIOUS!! I have seen many swarms as they are in the air and as they settle and sometimes when they fly away again, but never the moment they leave the hive. SO NOW YD HAS A SWARM TO DEAL WITH!!! 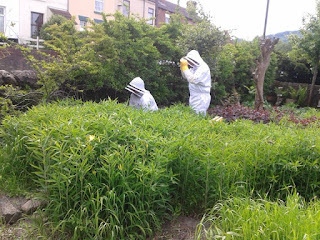 Here they are, they have knocked the bees from the pyracanthus and are placing a lid on the box which is on the ground among the golden rod and just a few feet away from where we gathered a swarm from an apple tree last week. When" all was safely gathered in " YD phoned us to tell us what had happened and that she thought that she had probably had enough excitement for one day! So we now have 2 extra hives. 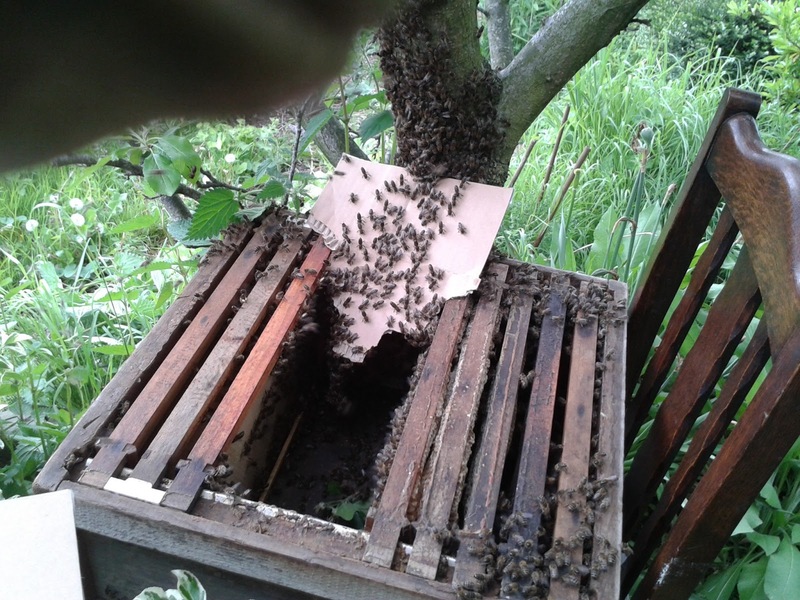 D and I had decided that we would probably sell a swarm, to keep our numbers manageable and perhaps realise a bit of cash. 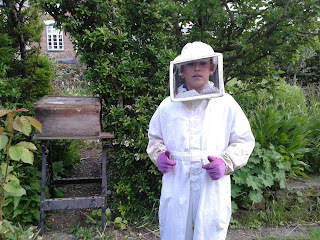 Gdson phoned us to tell us how friendly the bees were and how easy to box. He is currently working on some woodland management and wondered if we fancied a spot of bartering ? He and his dad wanted another hive and we want logs for next winter.Can you see where this is going ?! So a deal has been struck that suits us all. 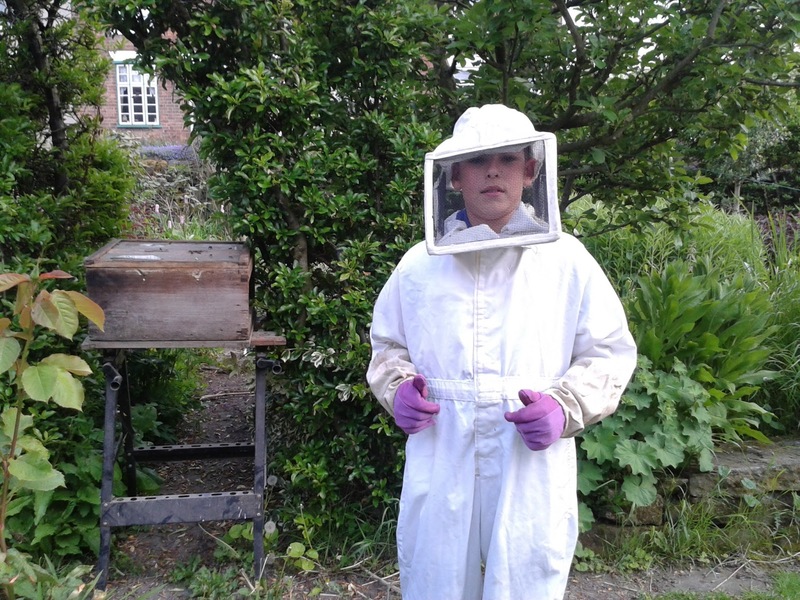 Gdson has collected his bees tonight and tomorrow D. will take the trailer for our wood. And YD ? er.. I had better think of a deal for her too .. A demi-john of wine should do the trick I reckon ! We are back from Cornwall and ready to get stuck in to the final planting push on the smallholding. The catch was not good again. D. bought back a 7lb ling and the lovely big pollack you see in this picture. 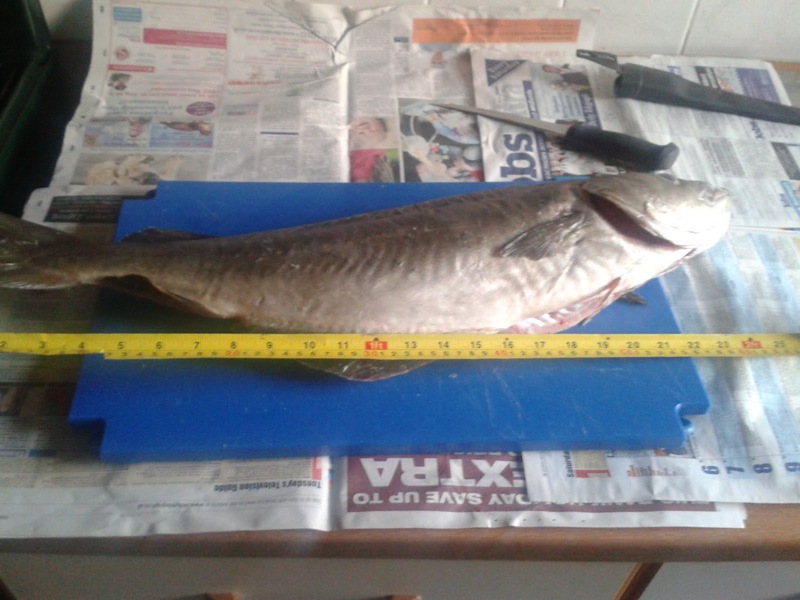 This made 6 good sized fillets and the ling I processed straight into cougon size pieces (20 in all) The second days fishing realised even less. It's a good job the weather was so nice and that D enjoys the company as much as the fishing AND that it isn't our living ! While D. was out on the briny I was car booting and charity shopping with my friend as well as working on her allotment. We stayed in the Callington area and did well. I actually had a shopping list. 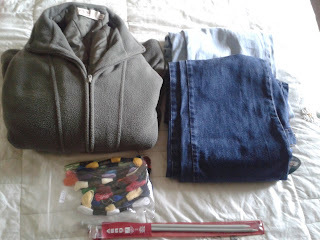 I needed working jeans as my others had patches on the patches, working shirts and was starting my search for winter clothes. Below, minus some shirts(50p each) that are in the wash, are two pairs of good strong, hardly worn jeans for a pound each and a really good quality quilted fleece for £2.99. You can also see some silks I couldn't resist (17 silks for £1.50) and some knitting needles for 20p. I also bought some fuchsias and geraniums for a bald spot in the fruit garden. So that has bought you pretty much up to date. I shall now make myself a coffee and catch up on the blogs I follow and try not to get too distracted reading the blogs followed by the blogs I follow!! I will then try to work out how many chicks are running around the place and who the h*** they belong to ! Today is my birthday, and though I'm not particularly bothered about it ( I might be if it was a "special" one) I have had some LOVELY presents. How about this Kath (Hillside House)?....I have been given a walking foot for my quilting!! By the way I am now 67. I don't feel it and on the rare occasions when I glance in the mirror I think "Who is that old crone?!" Today is the anniversary of D Day, I was born exactly a year later. In the next door but one's garden is a Union Jack. This is being flown by my neighbour who was at the D Day landings. he is a sprightly 96 year old who's brain is as sharp as a knife. He has a wonderful memory and many tales to tell. He flies the flag in memory of his fallen comrades. "We weren't brave, just doing a job, not much choice really!" Tomorrow we are going to the funeral of a dear friend's mother. We got to know her well over the years and we feel for his dad who at 93 will be at a loss I expect. Immediately after the funeral we will pick up a friend who is coming with us to... Cornwall!! 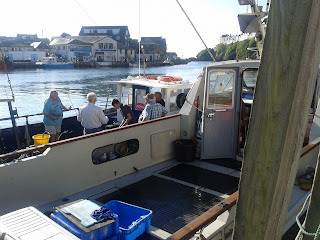 What a surprise, a whole month and we haven't been sea fishing. Yet again YD will take over here, bless her, what would we do without her?. We are told that the fishing has been poor over the last month. 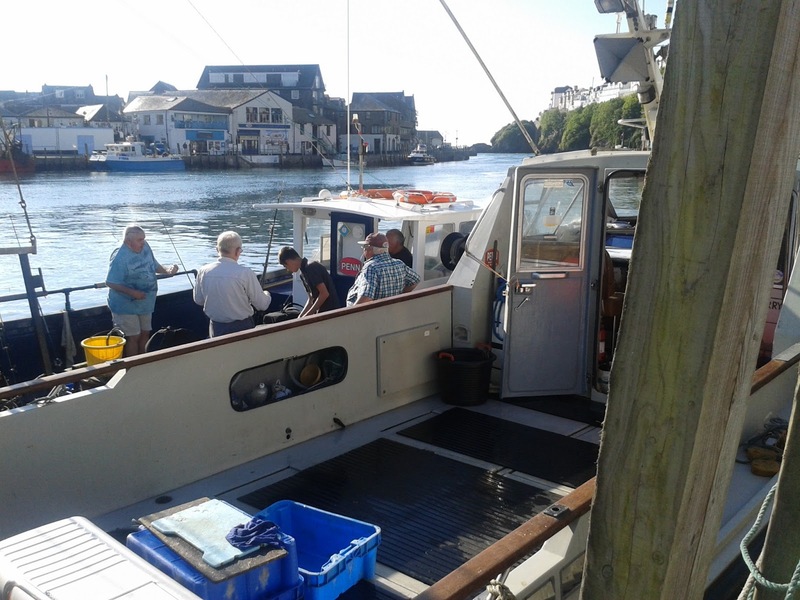 There is definitely a different feel to the fishing trips, with poor catches for most boats. I will let you know how we get on. Welcome Wallace, nice to see you here. 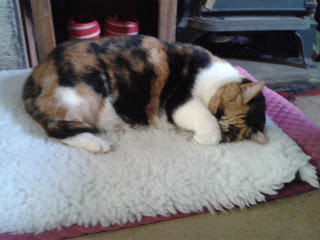 Off to bed for me now, early start in the morning. Here is the Pallet Stash from Saturday. 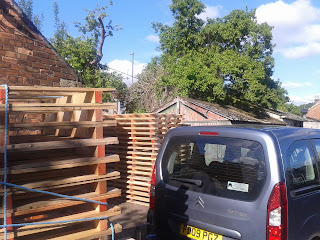 I think you will agree it is a useful couple of piles of wood. D. already has several ideas as to how it could be used. In the meantime it will have to be moved into "the Pallet Store" (of course) I shall enjoy that, especially as each pallet has to he hoisted over an eight foot fence! The sun is shining and the forecast is good for the next few days Hurrah! We went to a party at a friends house yesterday. They have a lovely big garden and field and all the children could run free. We sat in the sun eating hog roast buns, chatting to people we haven't seen in years and watching the children play and really enjoyed the break, even though we are always moaning that we haven't time for socialising! I even had a brief spell on the bouncy castle...Hot Tip ! Don't go on a bouncy castle in a long skirt.. you will keep standing on it and falling over! 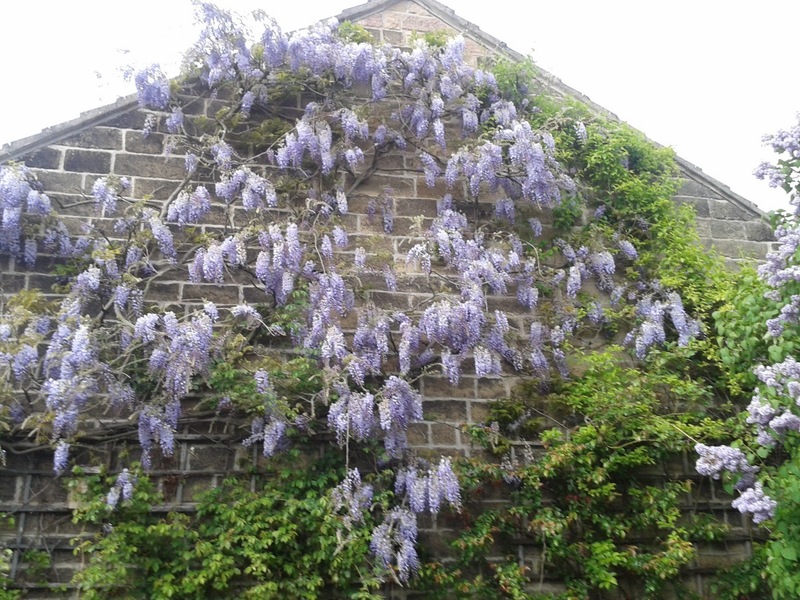 Thought you might like to see a pic of the Wisteria, we have it on two walls of the house and the long wall of the barn and it is at it'd best right now. I will bring your attention to the egg totals in the side bar. They are down quite significantly for May. This is because of all the broodys. Hens sit for 21 days on their eggs and don't normally start laying again for another 6 to 8 weeks after the chicks hatch. So it is hardly surprising the totals are down. Yesterday evening before we went out again, we did a spot of lawn cutting as there was little time for anything else. So while I'm in the fruit garden D. passes me the box full of clipping to put on the fruit garden compost heap. Moments later I heard an almighty crash and turned to see a fully-grown black BULL stood on top of the heap. 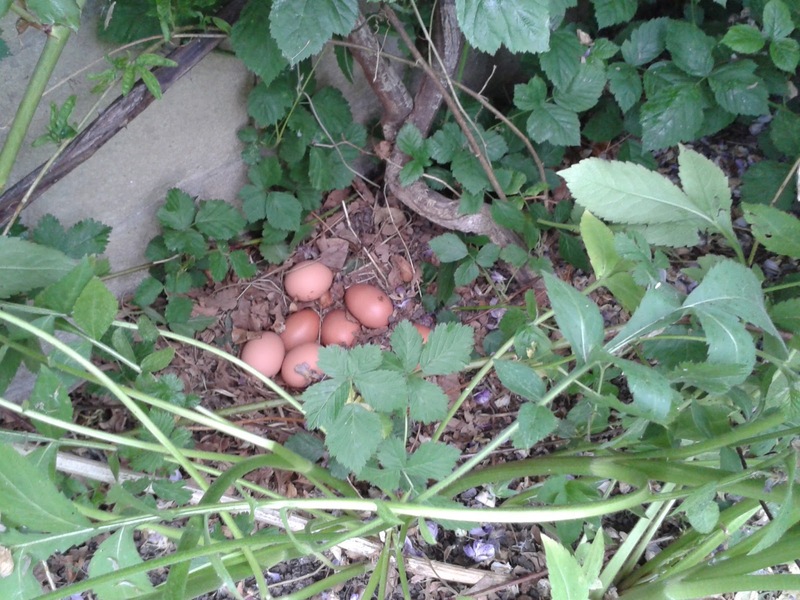 it had knocked down our stone wall and climbed onto the heap for the fresh cuttings!!! Now I'm no wuss but I reckoned I needed some help with this, so I shouted D. and we drove the big b****r back into his field and quickly covered the compost heap with tonne bags to lessen its attraction! So, that'll be a spot of wall building to add to the list then. Civic Society Committee meeting tonight, so need to tidy up a bit. I wonder if it will be warm enough to have it outside. That would be good, as it is tidier than the house ! Bye for now frugal friends and many many thanks for reading.